The 2800 sq. ft. flagship store opened ahead of Baccarat's 250 year anniversary. Architecture at Large, a multi-disciplinary practice working within the architecture, interior, art, and branding fields, recently transformed a blackstone Madison Avenue facade into a flagship store for Baccarat, a French manufacturer of fine crystal renowned for their craftsmanship and innovative designs. The facade draws inspiration from said craftsmanship of the 250-year-old brand. Composed of three-layers of custom frit glass, a large-scale, faceted pattern abstracts the cutting of crystal glass into a super scale pattern. 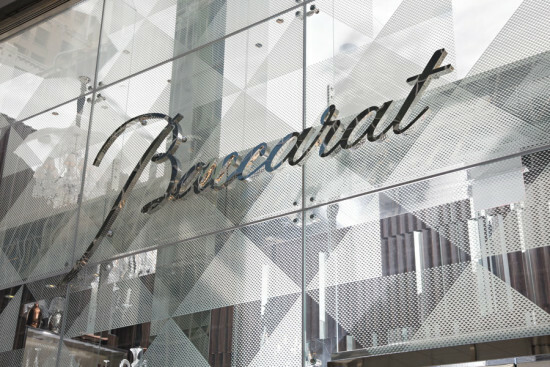 "One of the most difficult techniques in the cutting of crystal is the diamond cut," says Rafael de Cárdenas, founder of AAL, "and one of the key attributes that sets Baccarat apart from their competition is the level of intricacy to their cuts." Through various densities of fritting applied to the three layers, ranging in density from 25-75%, a dynamic shifting image is created for passersby and visitors to the building. The Baccarat facade affords limited views of the interior walls, lined with a disorienting blend of dark Macassar ebony wood interspersed with mirrored strips folded into a zig-zagged, corrugated surface. These walls—along with a large centralized chandelier hanging over the entryway—reflect daylight in the space. Cardenas says the sharpness of this feature wall was inspired by the brand itself. “We liked the idea of creating a mystery - of obscuring the interior to create a sense of seduction.” Specific portals utilizing clear glass were framed out on the ground level to establish storefront display zones, and selectively above to reveal the chandelier from the exterior. The retail project was composed of a notably significant project team, pairing two architecture firms with a code consultant, structural engineer, and project manager. The team ultimately influenced the identity of the facade through performative analysis. Fritting pattern densities were adjusted, and ultimately increased during the design process to promote greater heat retention within the interior space, helping to reduce HVAC loads on the building. The existing floor plates of the building were modified to create a large, two-story entrance to the store, resulting in a significantly altered facade opening, infilled with a two-story glass storefront. Through custom frit patterns and layering of material, Cárdenas’ team was able to produce an architectural effect that behaves like crystal itself. “The tradition of having a very holistic identity that has a street presence was definitely honed in Asia,” says Cárdenas, who cites Shiro Kuramata's work with Issey Miyake in the late 1970's as triggering a particularly dynamic retail design culture. "In Asia, all of the brands have their own buildings. Here in New York, on Madison Avenue, the architecture already exists. The facade has no relationship to the interior. With this being said, we were able to create a very strong identity using only glass." "I don't have a lot of confidence that the current plan commission would observe a plan that was adopted back in 2004," he said. Now a surface parking lot, the site is one of only two gaps in the continuous 1.3-mile cliff wall along the west side of Michigan Avenue between Randolph Street and Roosevelt Road. In the early-2000s condo boom, it was the proposed site of a 40-story condominium tower, but developer Warren Barr was hit with a foreclosure suit and lost the property to First American Bank, which still owns it. First American representatives did not respond to requests for comment. If it happens, the project would hardly be the firm's first in their hometown. 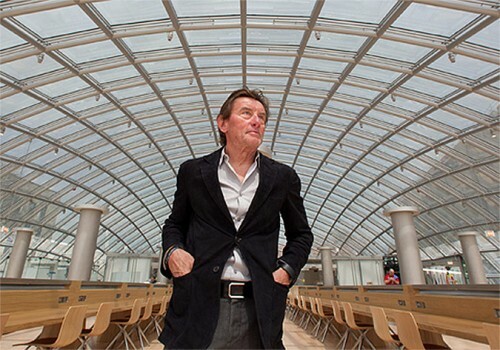 JAHN (mostly under their prior moniker, Murphy/Jahn) designed the United Airlines terminal at O'Hare and the Ogilvie Metra station downtown, as well as the State of Illinois Center (the Thompson Center), 600 N. Fairbanks, 1 S. Wacker Dr., and others. Yet lately most of the firm's high-profile work has been abroad. The School of Law at the University of Baltimore was founded nearly nine decades ago, but for most of that time its classrooms, offices, library, and clinics were scattered among several downtown buildings. That changed last year, with the opening of the John and Frances Angelos Law Center. Designed by Behnisch Architekten with Ayers Saint Gross, the Angelos Law Center unites a diverse program within a single 12-story structure. 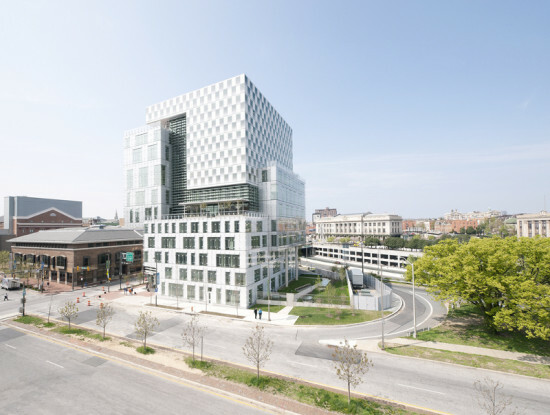 Its checkerboard envelope, which won Best Facade in AN’s 2014 Best of Design Awards, weaves the building’s three principal components—a classroom and office wing, the library, and a central atrium—into a single volume. In addition, the facade positions the university on the cutting edge of sustainable design. Its integrated approach to energy efficiency has helped the Angelos Law Center win several green-building prizes, and set it on track to achieve LEED platinum status. Behnisch Architekten took a tripartite approach to the design of the facade. The architects wrapped the portion of the building dedicated to offices and classrooms with an aluminum plate and punched window system. “This is the kind of facade that works very well with the kinds of spaces behind it, because those tend to be a bit more regulated and modular in the way they are allocated,” said partner Matt Noblett. 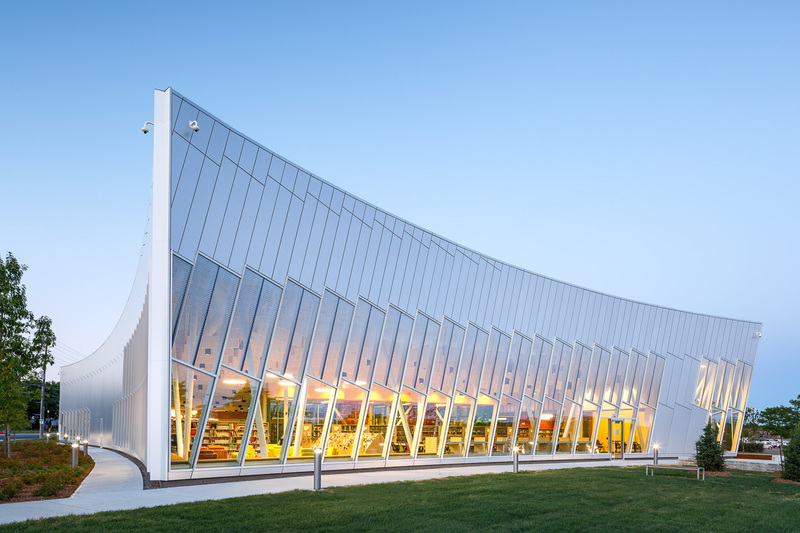 For the library, the uppermost of the building’s two L-shaped volumes, the designers chose a frit glass with a pattern they call a basket weave. “The library, from a program perspective, is kind of a big soup,” said Noblett. There are group study spaces, offices, and, of course, the stacks. “[W]e wanted to find a way in the facade to do [something] more neutral, less specific,” he explained. 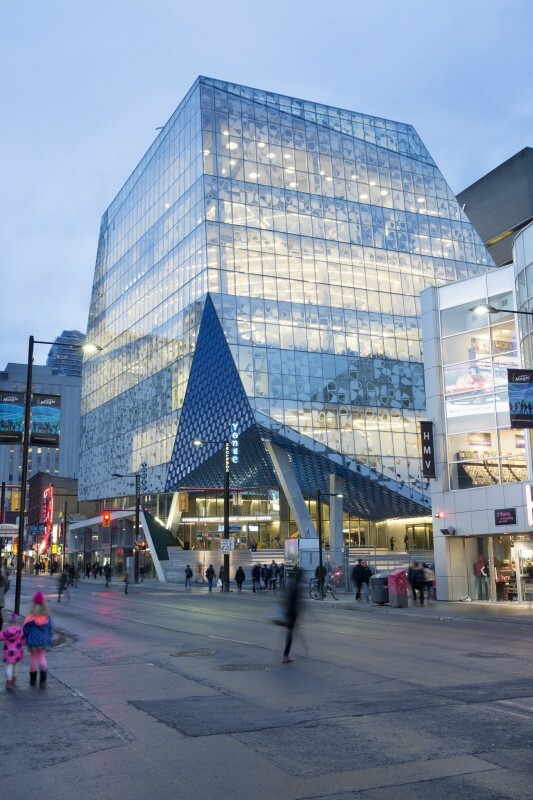 “The basket weave is less specific in how the articulation of the facade related to the program behind it.” The third segment of the facade, transparent glass enclosing the building’s atrium, draws the two other volumes together. The architects developed a unique sustainability strategy for each section of the building. For the office block, National Enclosure Company fabricated a unitized curtain system comprising the window surface, exterior blinds, and a glass rain screen. The Hunter Douglas Nysan blinds move up and down according to an automated program that operates the top one-third and bottom two-thirds of the windows separately. “It’s remarkable to look at the specific data, to see how much more of the year you’re able to maintain comfort without excessive amounts of air conditioning when you have an exterior sunshading system,” said Noblett, whose firm worked with Transsolar on the building’s climate engineering. Outside the blinds is a low-iron laminated glass rain screen mounted on aluminum brackets. While the architects initially designed the rain screen to protect the blinds, it also solved an architectural problem. “It had a tendency to reunify all of the facade into one building,” he explained. “The more you perforate, the less you read as one volume. By essentially shrink-wrapping [the offices and classrooms], you start to read it again as a [single] volume.” The library at the Angelos Law Center is faced with frit glass from Viracon. “We did a lot of study with the manufacturer” to determine the gradient pattern, said Noblett. “What we wanted it to read was as purely white as possible. We wanted the ceramic as close to the surface as possible.” The goal was to reduce solar gain to the bare minimum. “If you were designing the building and didn’t care how it looked, you would just build a solid wall,” said Noblett. 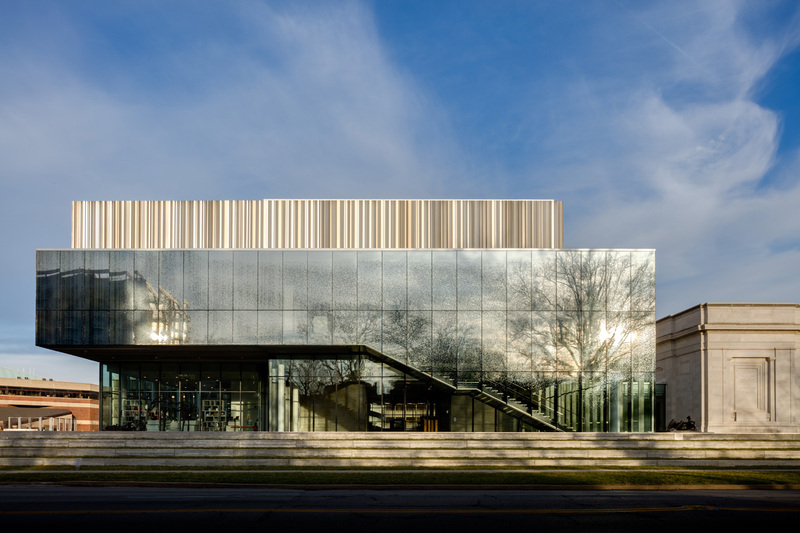 “The idea to add frit to make the wall essentially solid, [but] from the interior of the library it still feels like it’s open.” Outside the atrium, Behnisch Architekten installed a fixed brise soleil by National Enclosure Company on the south and west sides. The north side they left uncovered. All of the Angelos Law Center’s windows are operable, which, while not unheard of, is still unusual in a non-residential setting. “It’s hard to argue with a building where you can get comfortable by opening windows versus sealing up and running the air,” said Noblett. Noblett describes designing a high-performance facade as “this game you’re constantly playing between how much light comes in and how much solar gain [results].” By that analogy, the Angelos Law Center is a check mark in Behnisch Architekten’s win column. 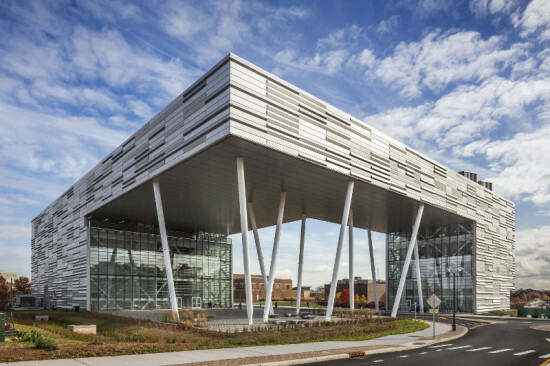 Multiple layers of glass combine with corrugated metal panels to balance visibility and privacy in the University of Pennsylvania's new research center. 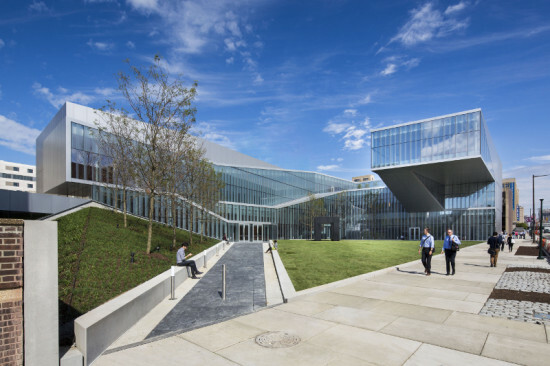 As an experiment in interdisciplinary research, the Krishna P. Singh Center for Nanotechnology at the University of Pennsylvania is not a typical science center. It follows, then, that the university would not want a typical laboratory building, with a central corridor and minimal public space. Instead, the University of Pennsylvania asked Weiss/Manfredi to design the Singh Center around two principles. First, the building should create a new campus green for the school of engineering and applied sciences, in keeping with both the university’s and the city’s tradition of building around open quads. Second, the building should maximize natural light and visibility without compromising the integrity of the research itself. The most outstanding feature of Weiss/Manfredi’s design is the multi-layered glass curtain wall on the Walnut Street side of the building, which was designed with facade consultant Heintges and installed by National Glass & Metal Company. 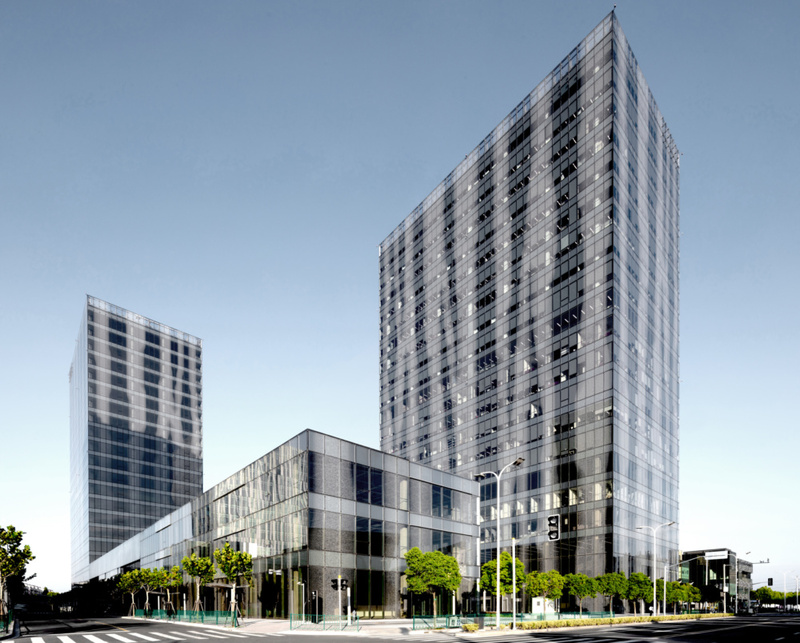 The outermost layer of glass, Guardian SunGuard AG 50 low-E on UltraWhite, which separates the building’s public spaces from the courtyard, achieves transparency while minimizing solar heat gain (the building is on track to achieve LEED Gold certification). It comprises an exterior etched panel by Walker Glass Co. wedded to a reflective panel with interior frit by JE Berkowitz. The etching and frit pattern varies from one part of the building to the next, for a total of five glass pattern modules. “The idea with that pattern was that where views out are most important, it’s most transparent,” said Weiss/Manfredi senior project architect Mike Harshman. “Where it’s more an issue of daylight, it’s more opaque.” The second layer of glass divides the Singh Center’s public spaces from its laboratory spaces. There, Weiss/Manfredi installed a laminated assembly with two layers of translucent frit. Again, the architects aimed for balance, this time between privacy and views out. Interior solar shades allow occupants to shut out daylight—or the eyes of passersby—when needed. On the first floor, an amber glass interlayer demarcates the research center’s 10,000-square-foot Bay/Chase Cleanroom. The color protects the interior of the cleanroom from ultraviolet rays and specific light wavelengths in the visible spectrum without walling it off completely. “Cleanrooms are typically a closed thing, but you can walk in and see everything going on in [there],” said Harshman. Glazed in interior fritted glass, write-up offices front the laboratories themselves, allowing light to enter the general labs. “We really saw the sections—the exterior glass, interior, and glass on [the] labs—as one assembly,” explained Harshman. The design allows daylight to penetrate deep into the building, while the combination of patterned glass and solar shades protects both the researchers and their experiments. The Singh Center facade is not all glass, however. Far from it. “From some views it looks like it’s very glassy, but the glass only represents one-third [of the building envelope],” said Harshman. “The rest is opaque and very insulated. The question became how to clad that surface.” Weiss/Manfredi explored a number of materials, including champagne-colored metal to echo the surrounding brick buildings. Ultimately the University of Pennsylvania chose silver anodized aluminum plate panels, explained Harshman, “because for them the context was technology.” The corrugated panels, which were fabricated and installed by Wyatt Incorporated with a custom finish by Spectrum Metal Finishing, were hung as a rain screen system over a prefabricated highly insulated exterior backup wall. “[There was] a great interest on Penn’s part that the project would have an aspect about scale and light. They liked the idea of the corrugated panels catching light at different times of the day,” said Harshman. The logic of the Singh Center facade culminates in the Forum, the multipurpose conference space that cantilevers over the courtyard. Its back and sides wrapped in protective metal, the Forum’s front wall is fritted glass overlooking the main campus. As a result, the place where researchers present their work is also the most connected to the university and the community around it. In the Singh Center, the University of Pennsylvania did not have to choose between openness and an effective research environment. They achieved both, with a building that turns traditional laboratory design on its head. The superhero and the Samurai. That’s where Zimmer Gunsul Frasca Architects (ZGF) began their design of the Hatfield-Dowlin Complex at the University of Oregon. The football player, the architects imagined, is like Batman: stealthy and strong, he came to his powers not by supernatural accident, but through relentless training. At the same time, the athlete is a highly skilled warrior, the modern-day equivalent of Japanese military nobility. 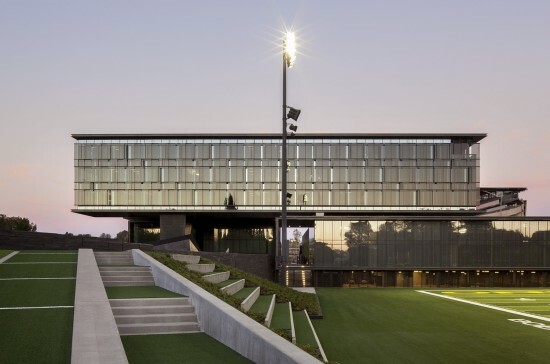 The facade of the new football training facility materializes these ideas in glass, stone, and metal. Dominated by horizontal expanses of tinted glass, it is powerful but not foreboding. ZGF offers the analogy to a suit of armor: the building’s skin balances protection and connection, solidity and agility. The most direct expression of the armor metaphor is on the Hatfield-Dowlin Complex’s west exterior. In Eugene, the real solar challenge comes not from the south, but from the west, where the sun hovers near the horizon for long periods all winter long. To minimize glare, the designers placed a floating sunscreen across the western face of the building. Using elevation studies and interior models, they determined the optimal placement of a series of tinted glass panels held in an aluminum frame developed by Benson Industries. The result is seemingly random arrangement of overlapping rectangles, which ZGF’s Bob Snyder likened to scales on a Samurai’s costume. On the other three sides of the building, ZGF installed a curtain wall of fritted, triple-pane insulated glass units supplied by SYP. The frit pattern was inspired by the nearby John E. Jacqua Academic Center for Student Athletes, which ZGF also designed. The Jacqua’s facade comprises two layers of glass, five feet apart with a stainless steel wire screen in between. 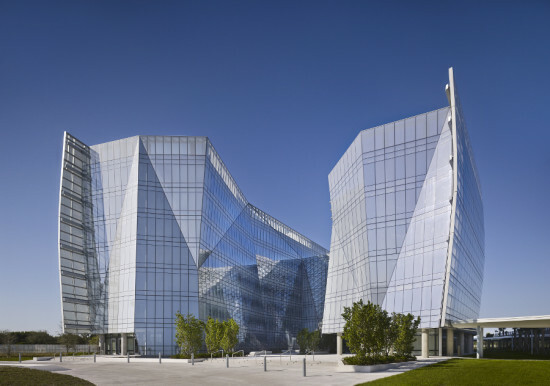 At the Hatfield-Dowlin Complex, the designers achieved a similar texture on a single layer of glass. “We saw that as a microcosm of the five-foot wall [at Jacqua],” said Snyder. The frit pattern was developed to be visible from both outside and inside the building, and to suggest movement as one passes along the facade. The final components of the Hatfield-Dowlin Complex exterior are stone and metal cladding. ZGF chose granite and basalt from Western Tile & Marble, which was treated with water jets for a striated texture. The designers used stone primarily on the first three floors of the building. “We established that as the stone zone, we wanted the weight of that material, the high durability of that material down low where folks would come into contact [with it],” said Snyder. Above, the stone transitions to aluminum panels for a lighter feel. “We worked with [Streimer Sheet Metal Works] to get the tightest radius we could get on the ribs of the metal panel,” explained Snyder. “We really struggled with that material [to make it] as fine as the stone, so it didn’t look like you were wearing tennis shoes with your tuxedo.” Plate-steel fins at the mouth of the parking garage and near the entrance sidewalk suggest the hard back of a dinosaur—yet another reference to armor. 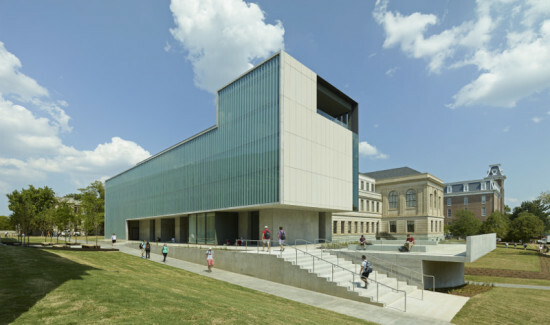 For Snyder, the combination of materials on the building’s facade achieve a balance between groundedness and ambition. Like the athletes inside it, the Hatfield-Dowlin Complex remains tied to the earth even as it appears to float above it. “The idea is that to be really good at football, you need to be right on the edge,” said Snyder.